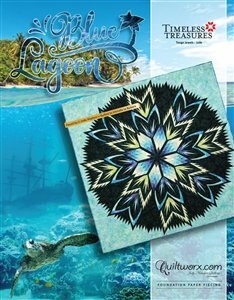 HOME > Judy Niemeyer Quiltworx > Blue Lagoon Pattern JNQ252P5 finishes 91" x 91"
Blue Lagoon Pattern JNQ252P5 finishes 91" x 91"
The Blue Lagoon foundation papers, strip piecing processes and color concept were designed by Quiltworx. The blocks in this quilt require a combination of paper piecing skills, strip piecing skills, and traditional piecing skills. The block is used in a 91” x 91” layout that includes (48) diamonds. The diamonds used in this quilt are called the Ribbon Star, Razor Star, the 16-Colored Diamond, and the Blank Diamond. The diamonds are surrounded by a Spiked Ring Background and the fabrics are the perfect colorway to remind you of a tropical snorkel adventure in a hidden lagoon. 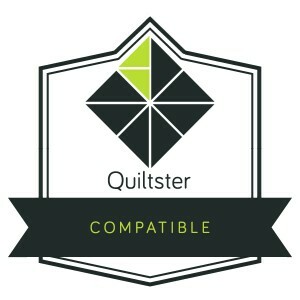 This pattern is Quiltster compatible!